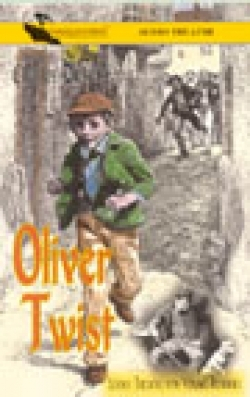 An abridged version of Charles Dickens’ classic tale of the orphan boy, Oliver Twist, is told on this theatrical, audiobook set aimed at young readers. Unlike many audiobooks, a narrator reads most of the story but various actors read the dialog of the major characters. This is extremely effective, especially for young readers and nonreaders. Set in England at the turn of the century, Oliver Twist was born in a workhouse to a poor mother who died soon after his birth. Brought up in an orphanage where death was a frequent visitor, and nutritious food was an infrequent occurrence; he, nevertheless, reached the age of nine. At this point, the boy had the audacity to ask for another bowl of gruel, was promptly labeled “difficult” and sold to the undertaker as a servant. Oliver’s melancholy demeanor fell in favor with the undertaker, who treated him as an apprentice. This provoked jealousy with the other apprentice and the undertaker’s wife and caused him to be unfairly treated by them. Eventually Oliver ran away, and found himself on the outskirts of London—scared, alone, and hungry. While wandering around, looking lost and bewildered, Oliver met the Artful Dodger, who led him to Fagan and his den of boys. Unknown to Oliver, it was also a den of thieves. After food and a good night’s rest, Oliver went with Dodger and another boy out to “work.” Caught in the act of picking a gentleman’s pocket, the two boys ran, leaving Oliver to take the blame. While facing the magistrate, Oliver fainted from fever, and a shopkeeper/witness came to say he was innocent. Instead of being put back on the streets, the gentleman took Oliver home, where he was nursed back to health. Though he must go through several more ordeals, Oliver, in true Dickens style, eventually finds a good home and complete happiness. This fast-paced and interesting audiobook is not for the Dickens purist, but a good introduction to classic literature for the young.